"Dance with a partner who can milonguear.... I usually don’t invite a woman to dance if I’m not confident I can navigate the floor safely with her." I think the followup post is fine as far as it goes, but it doesn't go beyond the obvious: refrain from silly kicks and don't stick your elbow out. It makes it sound trivial and ignores everything behind it, which is how people normally talk about women's work. I dance as both follower and leader on a lot of full floors, at various levels of orderliness, so I'm here today to start filling in the gaps. Be very communicative, so that your partner can always feel exactly where you are and what you are doing. Communication is two-way, continuous, truthful, and uninterrupted. Be very accurate. Your movements, response and expression are at high resolution, so very little space is needed for a detailed and interesting picture. Be very steady. Your partner can rely on you to keep within your own space and your own balance, all the time. They can confidently and accurately predict where you will go in response to their own movements, within a very small margin of error. Be very musical. Your feeling is fully expressed within your movements, whatever those movements are, and regardless of their size. This means complex steps and large movements are options, not necessities. You have your own ideas about how the music makes you feel, and you are expressing them within your embrace. The actions you would take to get these things working are mostly in common, so you don't need to prioritise them one above another. I'm not going to talk about things like not habitually flapping your heels around like a halfwit, and not insisting on a rigid, stuck-out arm or a bent-back international ballroom hold. They are obvious, they come under the heading "have a bit of common sense," and one sentence is enough. This depends on having a very clear, simple, and reliable relationship between the position of each of your shoulders and the position of the corresponding foot. It's usually called "having a good axis". You don't bend sideways or forward at the waist, drop the chest, push one hip out, pull it in, wriggle, lock one hip or knee, or stand with one leg tense and the foot held stiffly clear of the floor. All these things will break the line of communication. When you are doing it right, your partner can clearly sense the position of each foot in a close embrace. In effect, your legs and feet are included in your partner's proprioception. Making this possible is 90% a follower skill and only 10% a leader skill. You can practice and enhance your axis by standing, walking, doing solo pivots, or dancing, with a book or a heavyish bean bag balanced on your head (some dried lentils in a freezer bag are totally fine). This really helps to find the vertical line that you want to move around, feel how it moves in your body as you move, and make it thinner. Change weight, step slowly in all directions, turn gently. Generally, you want to think about simplifying, firming and straightening your movement so it can be exactly as you mean it to be. Everything else below will also help. This means you can interpret signals for direction, size, and speed over a wide range of each, but particularly at the smaller end. And these dimensions are independent; your smaller steps can have as much colour and detail as your larger steps, and all of this colour and detail is communicated to your partner, rather than being directed outwards. You can change weight one toe at a time, if the leader is capable of leading that. You can follow a pivot separately from a step and you don't automatically add a step just because you've pivoted. You don't mechanically stick one leg out when there's no reason to do so. You have the freedom to reverse from any point. Your feet move in close parallel lanes, not crossing each other or changing lanes unintentionally. Your free leg does not exaggerate or fly out anxiously in turns. Get a practice partner to lead small movements, slow movements, and movements that start one way and then retract, and pivots that don't end in a step (they might just stop, or go back the other way). You'll need to create stillness and quietness, to make a smooth space for the high level of detail. Simplify your movements. Drop any movement that you don't have a clear positive reason for doing. Don't "extend" when there's no reason to do so except stagecraft. And your partner needs to be listening to you. You can stop, pause, go back at any point in any movement. If your partner loses their balance somehow, you can probably rescue the situation, and if not, you will still be standing there. Your partner can fall over all alone, if they truly insist. Physically, this comes from a consistent relationship between shoulders and hips and having the position of your centre of gravity well under control. Everything already mentioned will help. You are stepping with your own intent, and not flapping about, wriggling, or putting yourself in any position you can't freeze in. It's not exactly about balance - you can balance in a position where it's easy to push you over. Groundedness is about very rarely passing through a position where it's easy to push you over. Smooth the transitions between steps, push continuously through the step, get your legs used to the transitions in all directions, and have your feet fall wherever they need to be, under your centre of gravity. A good (and fun) exercise with a partner is to dance normally and have someone stop the music at random moments. When it stops, you have to freeze in whatever position you are in. If you try to freeze and you have to take another step, then whatever you were doing is probably something you don't do well enough to do in the milonga yet. Both leader and follower are independently responsible for their own ability to freeze. (I am indebted to Andreas Wichter for this exercise). A good exercise to find out how it should feel is to have someone hang on to a scarf wrapped around your hips, and give you resistance as you walk. Or you can walk in water and focus on keeping upright. There is a fun test for this. Leaders who are poorly grounded will often lead bigger steps than they mean to, then fail to follow up with the rest of their bodies, unbalancing themselves and their partners. The effect is that the couple skitters around like a foal, and they bump into people even when they think they are leading perfectly sensible movements. Learn to notice when this is happening, and edit it by stepping within yourself and insisting on keeping yourself straight; don't rush around trying to keep up with phantom leads and nonsense. When you get it right, the leader will suddenly feel safe, because two of the animal's four feet are consistently underneath it and going where they intend to go, instead of constantly having to catch and correct. This takes some experience and decent physical condition to do successfully, but mainly you just have to know that it's possible and a good idea. Of course, some people can lead huge, fast steps without unbalancing themselves. In that case, go ahead and put your big wheels on. If you struggle with any of this physically, the fastest way to make a noticeable difference to everything I mention here is about 3 sessions a week for six weeks of practically any training that will strengthen your core. You can use one of those 7-minute workout apps, a samba class has worked well for me, ballet or yoga would work, press-ups, crunches, or any form of upper-body training will work, even running, if you do it right. Or you can do it how they did it in the 40s and just wash and dry all your clothes and bedding without a machine. If your regular work is not sedentary (for example, if you are a nurse, site engineer, market trader or care worker) you probably won't need to do anything special. You don't need to be super fit or powerful, just strong enough to to be stable without effort. The result is that your partner can feel where your feet are, and the subtle changes in your body as your hips turn. This means that you are using the full duration and shape of every movement to express your feeling about the sound. Your partner can feel this. The aim is to make it feel as though the music is coming from inside your body, from somewhere roughly in the middle. It's not that you're hearing something and pointing it out visually for an audience; it's internal and coming out because it has to. This is the answer to the beginner question "when am I supposed to do ornaments?". Do them when you can't help it, and otherwise don't worry about them. They are supposed to come from you. Find all your favourite tango tunes on YouTube and just bop along to them however you like. Wave your arms, wiggle, dance around, make faces, whatever, until your body knows what it wants to do and has different ways of expressing that. Learning specific ornaments by heart is tedious and can have embarrassing results, so I suggest not doing it. You can practice and enhance how this works physically in the dance with some exercises, like refusing a step. They will also improve your communication. Get your practice partner to lead something, and then just don't do it - actively refuse it in the embrace. Stop the step. Hold it up. Slow it down. Do it at different times during the step. Backlead a little to find out how it feels. Have your partner go with your suggestion, or not. Now try it musically; have your partner choose the movements (keep it simple), but you decide how smooshy or spiky, soft or sharp or decisive, it will be. You will find out what you can do without breaking the connection, what is interesting and fun, and what causes problems or confuses you. Turn your 'musical satnav' up and down. Make as many mistakes as you need, to feel confident that you know what you are doing. Delivering this physically takes some time, so if you are a beginner, don't let it worry you; just solve the problems in front of you, allow yourself to bop and get excited to tunes and rhythms you like, notice what you like, let your body respond, starting from the heart or centre, and it will get more coordinated with practice. You want your body to be a window for your emotions. Note that there are quite a lot of 'good' leaders who have no interest in the follower's musicality at all, except in terms visible to an audience; they want an obedient partner, of the highest available social status, through whom to show off, mainly to each other and themselves. The partner might as well be a car or an overpriced handbag. They are not listening to anything an audience can't see. I think it's dull and silly, but it's up to you to make your own sincere choice about what you want to do. Finally, I give you Monique's Stupendous Legs again. They are full of music, and also apparently full of water. Watch and learn. You don't have to be especially mobile or athletic; those things give you some extra options in the range and variety of movement, which are very good for dancing with certain people, but you're entitled to expect your partner to dial it back to what you can keep up with. It becomes rather pointless to lead lots of steps, which makes the dance less exhausting. All the possibilities of leading are still there, up to the couple's skill level, but they are now a free choice, over which you have a great deal of influence. They no longer need to be trotted out one after the other to avoid boredom, or planned in any way. Leading becomes both practically effortless and much more interesting to do. The distinction between leading and following becomes somewhat beside the point. You may find that you care more about who you dance with and what to. This video is quite well known. As a dual role dancer, I'd like to point out that what Ricardo Viquiera is doing here is not very difficult. I'd back myself and many of my friends to do it with the right follower. But don't even think about trying it with a follower whose axis, embrace, connection, communication, mobility, musicality and steering are not close enough to perfect. I would like to spell out and salute the physical courage and the excellent dancing of this young Korean woman in 8 or 9cm heels, on a shiny table that shifts with their movement, who the videographer credits only by her nickname, "Fish". Although I understand that in Korea this is a usual way of referring to professional dancers, I think that for a worldwide audience she should be credited by her name, Inkyoung Lee. Her performance here is far more impressive than her partner's. She is certainly young, tough, strong and agile, but saving yourself from a fall wearing those is hard, and she is at much greater risk of professionally-disabling injury than he is. And as far as this performance is concerned, Inkyoung Lee deserves a lot more than half of any international fame and prestige it generates, because that is her contribution to its quality. Many thanks to Susan Ang and Silvia Fracchia for telling me her name. It just struck me that a lot of my readers probably won't have seen this magnificent Line Rider mashup. I've had some very memorable tandas to this mad, long-post-mainstream D'Arienzo track of 1971. It takes real musicality to dance this - ticky-ticky-fuss-on-every-beat won't cut it, flailing about is pointless, and the rules of elegance certainly aren't going to help you. On the other hand, seeing a whole room respond to the pauses in all their different ways like a shoal of strange fish is very special. This post talks you through my YouTube playlist of people I think it is helpful to watch if you are a woman who is a good follower and is learning to lead. Most of this will also be of use to anyone working on their leading; with the usual obvious caveats about who you want to dance with, how you want to dance, and what your priorities are. My own dance prioritises pleasure above prestige. YMMV. There are more videos in the playlist than the ones I'm going to talk about, and I might add more from time to time. I suggest watching Léna to give yourself a mental picture of what a woman's body can look like, leading well. I hope it will help you visualise better what you want to do, without the visual confusion of a drastic difference in body shape. Notice the beautiful walk from 02:00 and the turn at 02:17. More videos - vals and milonga - in the playlist. You may also notice the waterfall* at 02:52, very characteristic of the French dancers for many years and popularised by Carlitos in this no-brakes vals. It took me way longer than I expected to figure out how this is done. It's fun but not necessary. Some of Oscar Casas' teaching summaries are in English, some in Spanish. A lot of them give you simple, reliable ways to do really useful things without overanalysis. The ones with Ana Miguel are generally of higher quality, except for two essential ones with Mary Ann Casas. As an exercise, this is a staple of the Nuevo Tango teaching approach. Learn to lead back, side, and forward steps at will, then curve it and wind it up into a turn, then change direction. ("Nuevo" and what is often called "Milonguero" are essentially the same thing with a different sensibility or goal). Note that this method of leading a cross - the 'lazy' or sideways one - is pretty bulletproof and will usually work well with beginner followers. Possibly the most practically useful two and a half minutes of tango video ever made. What Oscar does in this is everything you actually need for tango, vals, and milonga. If you are musical and sensitive to your partner, which you should be if you already follow well and you can learn to keep your place on the floor, you have everything you need for social dancing. Everything else is optional. Some people manage perfectly well with much less. This begins with a simple, reliable way to lead a linear or salon-style cross. You can break it down further and get a lot of different options, but you'll also be completely fine if you just use this one. Lots more in the playlist. One side note - I suggest ignoring Oscar's technical advice to followers, which he only offers when Ana isn't there. Alexis is a Chilean living in Barcelona and teaching in France and elsewhere with Celine Giordano. He is a 'lazy' leader, using solid technique and interesting musicality to create a very appealing, pleasurable, low-apparent-effort dance. He does practically nothing useless, superfluous or showy: watch any of it, pick something you like, and try to work out how to do it. You probably won't get it, at least at first, but it's almost impossible to avoid learning something useful while you try. The chained swoosh* at 01:05, and in general a wonderfully sensual approach to this beautiful Di Sarli instrumental. One I personally prefer to the 'mundial' style (often branded 'salon') with its intensely tedious, glossy, chilly turns. Rocked ochos from 01:39 - and generally, this one is full of things that are brilliant in their simplicity. Crossed walk from 00:35 to 00:41. This is technically not easy, and risky in social dancing, but it's a brilliant exercise to have on your list of things to try. The tango is followed by a calm milonga in the same video. I draw your attention to 01:09-01:15 and 02:08 to 02:18. Sure, I can lead those movements (the second is just a well-timed weight change), but would I ever have thought of leading them then? Admittedly both of these require an excellent partner to be worthwhile; they would be utterly wasted on someone who just follows and doesn't dance with you to the music. Alexis feels absolutely solid to dance with; he is extraordinary at creating stillness and a sense of perfect security and calm, to which the face like a decaf koala contributes less than you might think. On a good day, I remember to aim for that stillness in my own dance. This is a summary of a fundamentals class. The verbal explanation is in slow French with a German accent, but this is still useful to watch even if you don't understand French well, or at all. I provided a translation some years ago. They discuss posture and embrace, and then give one very simple and reliable way to lead each of a weight change, a side step, and a walk. Their book provides very useful information about various technical options, with tips for productive practice, and the accompanying DVD includes a good way to practice pivots at home without injuring yourself. You can use it as a comprehensive course, but even if that's not your approach I recommend looking at it if you are in a position of having to teach or mentor anyone, especially yourself. It will save you quite a bit of time if you can figure out how to make best use of it - my full review and user guide is here. Check the troubleshooting checklist hidden on page 156. A video I find not so much useful, as motivational. I watch this sometimes to reconnect myself with how I want to dance, and avoid getting sucked into how other people want to dance. My favourite bit is the sensual perfection of 01:35, which is how those are supposed to work. You will spend hours watching and rewatching, just not being able to understand what on earth is going on. Tip: if you save a copy of the video using something like savefrom.net or whatever you normally use, and then watch it on a tablet, phone, or computer with a free media player like VLC media player, you can play it in slow motion. It will still take ages. Try to work out just part of it and go from there. You will spend hours trying to do a mirror-image of whatever it was you saw, which is much more difficult than the original version. You will totally misunderstand what was happening and learn something else entirely. Eventually, you will work out what it was you actually led. It will just not work because crucial information is missing or something you had overlooked is much more important than the thing you noticed. You will come back to it a year later and find out what the thing was. Etc. Don't worry about it. An account of my own approach is here. * In this post I use my own English names, like "waterfall", "swoosh", and "rocked ochos" for some things that don't have established names in English. These are just my names for things that need names. They're probably not the same names you would come up with if you didn't know how they felt to follow. Go ahead and use them if you like them, but don't expect anyone to know them. I think 'swoosh' is obvious, and 'waterfall' refers to the tumbling, chaotic sensation of following it. Visting maestra, dancing 'socially', whirling 10cm heels hip-high - I was severely tempted to catch one in my hand as I stood by the dance floor and hold on to it - perhaps with the background thought of expelling it via the window, like a confused September bee. I have to wonder if anyone has ever done this in reality, as opposed to imagination. Not the window part, obviously. 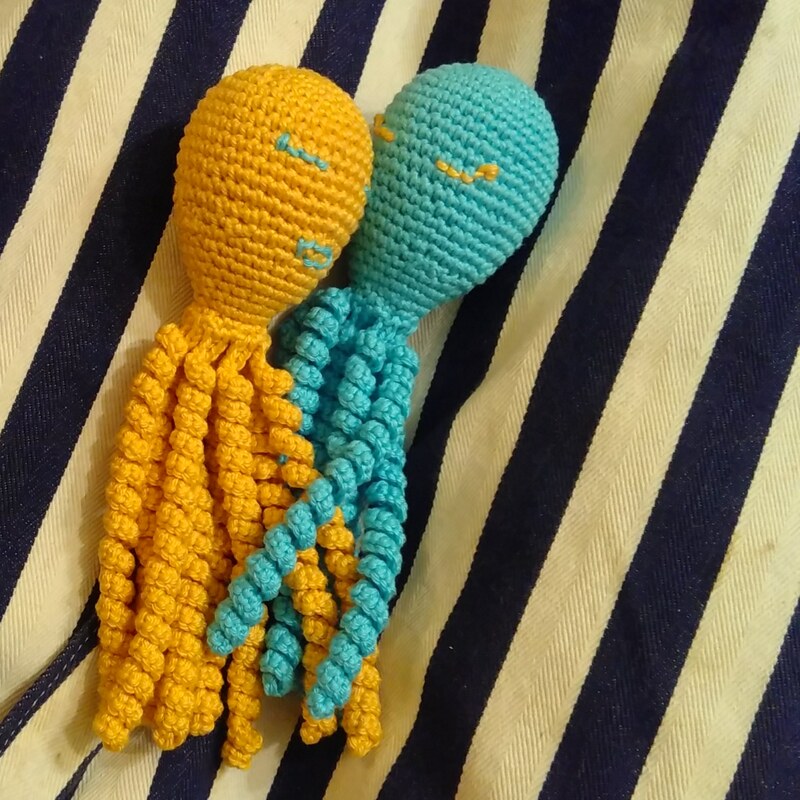 These two amusing little creatures are my first attempts at the Octopus for a Preemie pattern. They are made by volunteers to go to hospitals. The hospitals give them to premature babies in incubators, so they can wrap their minute hands around the slender tentacles, as they would with the umbilical cord; it keeps them calm, and stops them pulling out the tubes that are keeping them alive. When they leave the hospital, I think they take them home, but the parents are advised to put them aside because they're not advisable as a toy for a fully developed baby. The octopuses have to pass a rigorous quality inspection, and since these are my first try, it's likely they won't pass. Most people's don't. I've done my best, but I'm not sure if all the stitches are tight enough or not. But if they don't pass, they won't be wasted - they will be given to babies that didn't live. It could be that I've made them to be grave goods, which is a thing to think about next time you watch a pop archaeology programme on telly. The world-wide list of group websites is here. I gave the Facebook link above because the UK one is down for maintenance. The Argentinian group Abrazos de Pulpitos has good tutorials on YouTube. A few things I have learned about dancing, by regularly dancing both roles socially for two or three years. My experiences may or may not be in common with anyone else. There is a tremendous range between OK, good, and great followers, of which they are almost all totally unaware. Leading poor followers is very difficult; it requires a range of skills, resilience, and physical training. Leading OK followers is fun, especially if they are interested or enthusiastic and easy to be with. Leading good followers is more fun, especially if, etc. Leading great followers is amazing, and you don't feel like you have to do anything, and whatever you do do is totally effortless. There are a lot more than those categories. Don't bother raiding the cool guys' “harems”, they're disappointing, dance-wise. In a good ronda, under good physical conditions, with good followers, leading is cognitively much less demanding than following. The difference is dramatic. Getting the basics to a good standard is quite a lot of work, but if you can do that and then stay within what you've mastered, good and great followers will dance with you, and it is effortless. It is possible to flirt with the table of glamorous Dutch lesbians through the medium of another woman's body. I curl up with the prickles on the outside if you scare me. But if you persevere I can sometimes be persuaded to eat out of the hand. What's so hot about Ruby? O London Bus, thou art translated! Grandma Post: Je ne regrette rien! New Videos of Ricardo Vidort! "I gave [him] the message. He told me (in Spanish): 'You have no idea how nice it was to dance with her, a real pleasure' (here he was rubbing his heart). 'She enjoys dancing so much and you can feel it when you dance with her, it is a wonderful feeling.'"